They're"Hina-Ningyo". I happened to see them in Nara,on this March. People use bamboo to display these dolls. I think this kind of display is rare in Japan,but it's interesting. 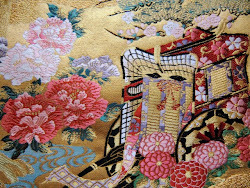 This is an ancient kimono. These are balls of cotton wound tightly around with threads of many colors for bouncing. The two people(on the top shelf) are emperor and empress. The three women are servants. This is one of typical way of dispray. This is also emperor and empress,and their servant. These dolls are also disprayed. This girl is carrying a balance. This doll has a hat decorated with wisteria. This is an annual event in Takatori,Nara, and every year,many tourists visit to enjoy this event. "Aoi-matsuri" is known as most graceful and elegant festival in Japan. and they march along the main street.They're about 500 people. They recreate the 9th-century Japanese aristcrat people and their culture. And they had a good crop,and they recovered peace and quiet. This is the origin of this festival. People in Kyoto has maintained this traditional festival faithfully. This man disguise himself as an aristcrat in Heian era. This is an ox-drawn carriage,used by nobles in the Heian era. These kids are also marching,wearing colourful ancient clothes. This is a portable shrine,only for noble person. This flower umbrella is believed to protect people from evil. This man disguise himself as an imperial bodyguard.